Gloucester (pronounced "glaw-ster"), Massachusetts—a city on Cape Ann about 40 miles north of Boston—is the oldest fishing port in America. Fiercely proud of its nearly 400-year history and its continued major role in the fishing industry (not to mention its on-screen notoriety from the reality TV series "Wicked Tuna" and Hollywood blockbuster "The Perfect Storm"​), Gloucester is more authentic than touristy. And that makes it a must-visit destination for travelers seeking a true taste of New England. Commonly known as "The Man at the Wheel," the Gloucester Fisherman's Memorial is a moving tribute inscribed to "They That Go Down To The Sea In Ships." An estimated 10,000 Gloucester fishermen have died at sea. The monument, commissioned in 1923 during Gloucester's 300th-anniversary commemoration, has become the city's iconic symbol. The 8-foot-tall fisherman, cast in bronze, has looked out over Gloucester Harbor from his position on Stacy Boulevard since 1925. Gloucester's proximity to Stellwagen Bank and Jeffreys Ledge—two nutrient-rich, raised areas on the ocean floor that are like banquet tables for whales—make it one of the best New England ports from which to depart on a whale watching voyage. There are several whale watching companies that offer frequent departures from Gloucester during the season when whales are feeding: typically mid-April through October. Both ​Cape Ann Whale Watch and 7 Seas Whale Watch guarantee whale sightings, which means if you don't spy a whale, you'll be offered free tickets for a future trip. Gloucester has several beaches. The prettiest is Good Harbor Beach, which offers views of the Twin Lighthouses on Thacher Island and of smaller Salt Island, which you can walk to at low tide. Swim, boogie board, play beach volleyball and build sand castles in the summer. Surf the waves or walk along the sand year-round. Stay at Blue Shutters Beachside Inn, and you'll be steps from Good Harbor Beach and have the best ocean view right from the couch in the living room. There's something about the light in Gloucester and this rocky peninsula's natural beauty that has beckoned to artists for nearly two centuries. Don't miss the chance to see artists at work and shop for their one-of-a-kind creations at Rocky Neck Art Colony, the oldest continually working art colony in America. Dozens of painters, photographers, potters, jewelry makers, and textile designers have studios clustered along this waterside strip of land. Touring Cape Pond Ice is the coolest thing to do in Gloucester where year-round, the ice house is kept at 28 degrees F. When Sebastian Junger's book, "The Perfect Storm," was made into a movie in 2000, the ice business that has supplied Gloucester's fishing boats since 1848 shot to fame. All these years after actor John Hawkes wore a Cape Pond Ice T-shirt in the film, sales of souvenirs with the famous logo still make up 8 to 10 percent of the company's annual earnings. The rest of their cold cash is made selling frosty blocks. You'll see the antique machinery that produces up to 150 tons of ice every day. 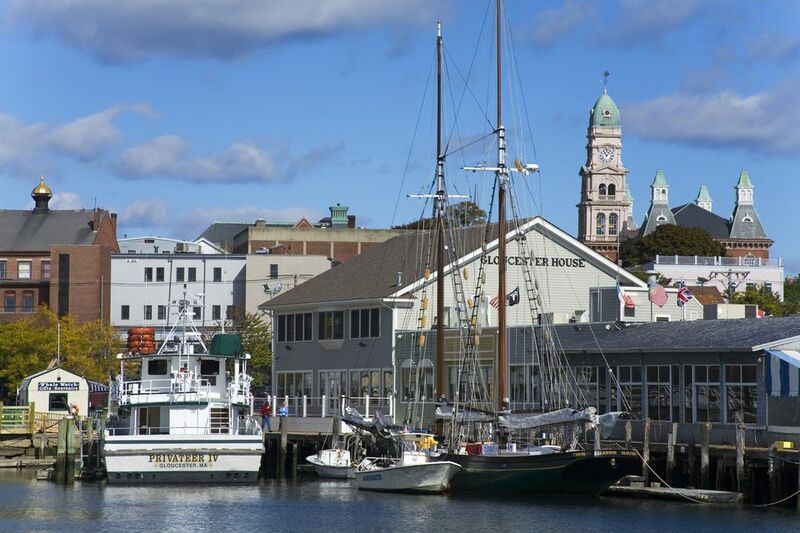 You'd be remiss if you visited Gloucester and didn't eat fish, lobster, and other sea fares fresh out of the Atlantic. America's oldest fishing port still has active commercial boats that chase groundfish like haddock and cod, pelagic fish like tuna and New England's favorite crustaceans: lobsters. ​Gloucester House, a fixture on Seven Seas Wharf since 1958, is a reliable place to satisfy your seafood cravings, from raw oysters to pan-seared tuna to lobster rolls, served either warm with butter or chilled with mayo and celery. Lobster pie, lobster carbonara, even lobster stuffed lobster—the menu is loaded with indulgences, and the service is warm and welcoming. Gloucester is actually home to a medieval-style castle. This fortress on the coast built with Cape Ann granite was completed in 1929 for prolific inventor John Hays Hammond, Jr. Most famous for developing radio control, Hammond earned some 800 patents during his lifetime for inventions as diverse as torpedo systems and luxury shaving cream. On a self-guided tour of Hammond Castle, you'll see marvels like the Great Hall's organ with its 8,200 pipes and a 30,000-gallon swimming pool that can be switched from fresh to saltwater with the switch of a lever. The attraction's season ends each year with Haunted Halloween evenings. Maritime Gloucester is a multifaceted waterfront attraction: part museum, part aquarium, part working shipyard. It's your place to touch a sea star, learn about and observe Gloucester's fishing fleet, view multimedia exhibits and even set sail aboard the Schooner Ardelle: constructed almost completely from materials salvaged from another schooner. Gloucester's swanky Beauport Hotel, which opened in 2016, is a bit out of character in this rough and tumble fishing town. But even if you don't stay overnight (the rooftop pool, whirlpool, and bar will sure make you want to in the summer), make a reservation for dinner. There are phenomenal water views at "1606 At Beauport" Restaurant and Oceanfront Deck as well as creative cocktails and a menu that features predominantly steaks and seafood including hearty comfort dishes like black skillet lobster and shrimp casserole.